Raj Tours and Travels is the name widely acknowledged for prompt Air Charter & Ambulance Services in Nagpur. 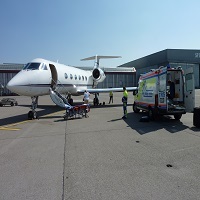 We offer Air Charter & Ambulance Services to our clients located in different parts of the city. We share good bonds with the leading Air Charter Companies and Hospitals to provide you the best of our services. Moreover, we ensure that our Air Charter & Ambulance Services are provided in the most hassle free manner and on time. For all your Air Charter & Ambulance Services, we are there to help you 24x7 with utmost ease.